Easter is my favorite holiday – in our house it’s even bigger than Christmas. Even before we started homeschooling, we did a ton of Easter activities leading up to Easter weekend. Thanks to Pinterest, there is no shortage of inspiration, either. While crafting for the sake of crafting is fun, I enjoy doing crafts and activities that either have a message, or can be used to practice skills we’ve been working on. 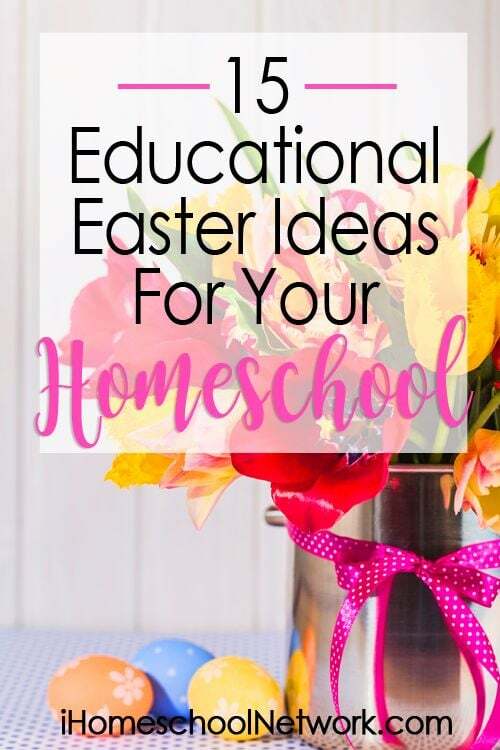 I can’t wait to incorporate some of these educational Easter ideas into our homeschool lessons this year. Cross Suncatchers – These are so easy to do, even with preschoolers. They also make cute gifts to hand out on Easter Sunday. Pom Pom Easter Egg Painting – This is fun alternative to using a paintbrush, and your children can play with different sized pom poms to vary the print pattern. Coin-covered Cross – This craft uses up all your spare coins lying around the house, and serves as an object lesson for your children. Paper Bag Donkeys – These are a cute idea for Palm Sunday. Paper Plate Easter Baskets – This is a step-by-step tutorial to make an Easter basket. Easter Egg Toss – This is a simple game with many variations. It can be used to practice number recognition, addition and subtraction, or multiplication and division, depending on the age of your child. Guess The Number Egg Game – This is a fun way to practice number recognition and counting skills. Jesus Washes Sins Away Science Experiment – This is an awesome experiment to demonstrate how Jesus washes our sins away. How Big Is The Bunny? – Here is an Easter math activity for preschoolers and toddlers. Tinker Basket – This is a great idea for kids who love to create. Alphabet Egg Match – This is a great activity for your preschooler to practice upper and lowercase letter recognition. Easter Egg Syllables – This activity uses plastic eggs to practice reading two-syllable words. Easter Egg Word Families – Another clever use for plastic eggs is to practice word families. Bunny Hop ABC – This is a fun game to practice letter recognition. Hatching Beginning Sounds – This is an activity for your preschooler to practice matching beginning sounds. What are your favorite Easter crafts and activities? Melanie is a sleep-deprived mom of three. She lives in Johannesburg, South Africa.